Miami Trace senior Austin Brown takes the ball to the basket against Vinton County’s Eli Griffith in the first varsity basketball game in Miami Trace’s new gym Tuesday, Feb. 5, 2019. Brown led the Panthers in scoring, rebounds and blocked shots in a 43-38 victory. Tuesday night, Feb. 5 marked the first varsity basketball game to be played in the new Miami Trace High School gymnasium. The Panthers had not won a game since Dec. 27, a 56-48 win over Greeneview in the McDonald’s Holiday Classic. In front of a large first-game crowd, the Panthers defeated Vinton County, 43-38. 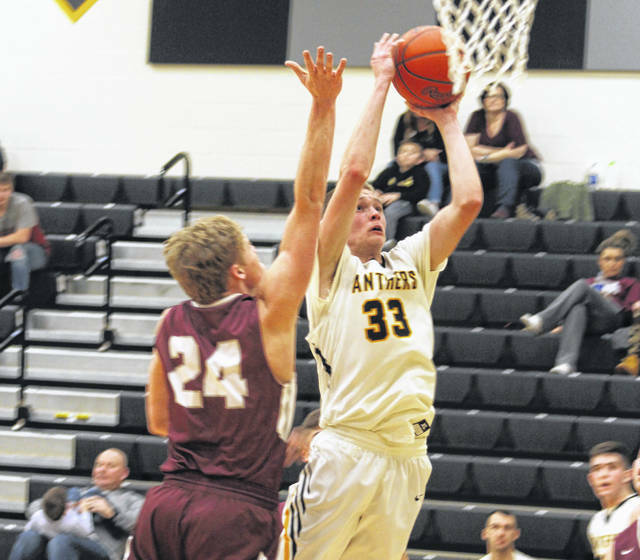 Senior Austin Brown led the Panthers in scoring with 12 points. He also led the game with eight rebounds, tied for the team high with two assists and blocked four shots (also a game high). Brown also hit the first basket in the new gym, coming with 7:24 to play in the first quarter. Sophomore Logan Rodgers had 11 points and seven rebounds and senior Austin Mathews scored eight points. Mathews also sank the first free throw in the new gym with 5:55 to play in the first half. Although Vinton County’s Lance Montgomery hit the first three-point field goal in the new gym, sophomore Dylan Bernard made Miami Trace’s first three, that coming with 2:30 to play in the first half. Miami Trace held a 10-9 lead at the end of the first quarter and led 18-16 at halftime. After leading by as many as six points, the third quarter ended with the Panthers clinging to a 30-29 lead. The lead changed hands four times in the fourth quarter until a basket by junior Trevor Barker put the Panthers back in front, 34-33 with 3:04 to play in the game. Miami Trace led by as many as seven points (40-33) with 1:42 remaining. The Panthers made 3 of 6 free throws in the final 18 seconds to preserve the win. Senior Eli Griffith led the Vikings (8-9) with 12 points and sophomore Lance Montgomery scored 10. Miami Trace head coach Rob Pittser began his post game remarks by giving his appreciation to the fans. “This place was loud, it was raucous,” Pittser said. “It was a great home crowd tonight for a team that has struggled to put wins on the board. I know the new facility helps with that a little bit. Our student section and our crowd really gave us some extra energy tonight. “Our kids were excited,” Pittser said. “They were excited about the new facility and all that comes with it. Vinton County is a scrappy bunch. We absolutely had to play our guts out tonight to hold on to this one and we were fortunate to be able to do that. Pittser concluded his remarks by thanking the taxpayers of Fayette County. Miami Trace (2-18) is back at home Saturday to host the Washington Blue Lions. Washington improved to 12-6 with a 47-42 win at Unioto Tuesday night. There will be four games in the new gym Saturday, starting with the boys j-v game at 3 p.m. and followed by the girls j-v game at 4:30 p.m. The varsity boys game is slated to begin at 6 p.m. and the girls varsity comes up at 7:30 p.m. Note that start times for the last three games are approximate. MIAMI TRACE — Austin Brown 5-2-12; Logan Rodgers 4-3-11; Austin Mathews 3-2-8; Trevor Barker 1 (1)-0-5; Kyler Conn 0 (1)-1-4; Dylan Bernard 0 (1)-0-3; Ethan Steele 0-0-0; Cody Brightman 0-0-0; Cameron Moore 0-0-0. TOTALS — 13 (3)-8-43. Free throw shooting: 8 of 14 for 57 percent. Three-point field goal: Barker, Conn, Bernard. Field goal shooting: 16 of 38 for 42 percent. Three-point field goal shooting: 3 of 10 for 30 percent. Rebounds: 28 (9 offensive). Assists: 6. Steals: 5. Blocks: 4. Turnovers: 14. Personal fouls: 10. Bench points: 3. Second chance points: 6. Points off turnovers: 9. VINTON COUNTY — Eli Griffith 6-0-12; Lance Montgomery 2 (2)-0-10; Gavin Arbaugh 2 (1)-0-7; Will Arthur 2-0-4; Austin Hitte 0 (1)-0-3; Trafford Dunn 0-2-2; Randall Matteson 0-0-0; Ash Abele 0-0-0; Eli Radabaugh 0-0-0. TOTALS — 12 (4)-2-38. Free throw shooting: 2 of 3 for 67 percent. Three-point field goals: Montgomery, 2; Arbaugh, Hitte. Field goal shooting: 16 of 45 for 35 percent. Three-point field goal shooting: 4 of 15 for 26 percent. Rebounds: 24 (10 offensive). Assists: 2. Steals: 4. Blocks: 0. Turnovers: 13. Personal fouls: 17. Bench points: 3. Second chance points: 6. Points off turnovers: 13.